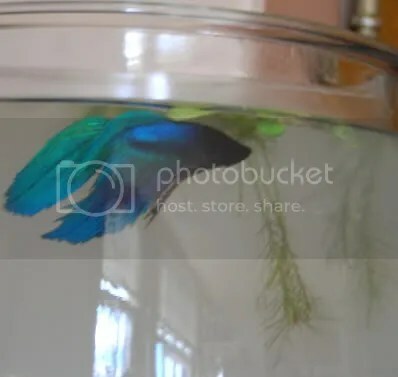 I’ll skip the 25 years ago tank story for now. . . . . . . .
September 19, 2009 I bought a betta to ease me through grief. I want another dog. I am not prepared at this time to fight with the landlord. I was too busy dealing with the first crisis; cloudy water in 24 hrs. and it is a lot more work than I care to engage in. I am a non-trad student; hobbies are fine but study comes first. getting rid of all the roots, this is as close as I came. However, this is a really good shot of his coloration. I went to the LPS to buy a 5g, it is better for him & better for me. I also bought all the mechanical junk that goes with it. 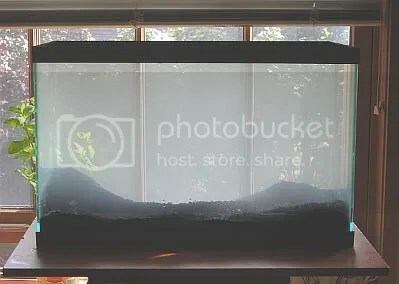 Based on my foggy recollections of my previous tanks, I got most of it right. FredFish perked up on the two day excursion out of the betta hotel. would swim nose-to-nose around the back of the tank for hours. while recovering from the fin-rot he came with. he swam patterns looking for reflection-fish. 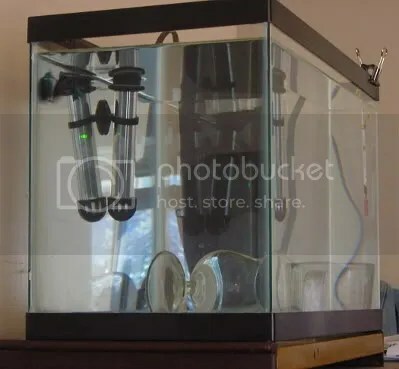 about cycling a new tank. Why did none of this sound familiar? to stock the 20, all those years ago. 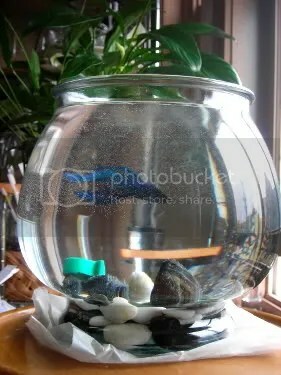 So, I take the plunge; one fish, why not? This is what not to do, dear noob. Wash the media before putting it into your tank. Do not expect your filter to clear it up. You’ll blow the filter. Just trust us. Now I have a few hobbies; pottery being one of them occasionally, I knew better. Silt=bad. 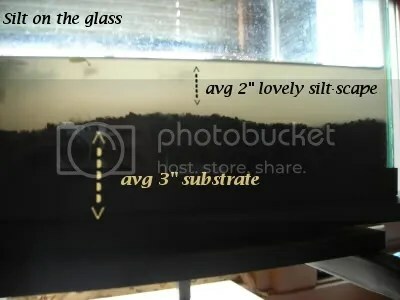 Silty, water, mucky mess, out comes the water, out comes the fancy Flouralite substrate. Just a few illustrations for the noobs who are not convinced, . . . yet. 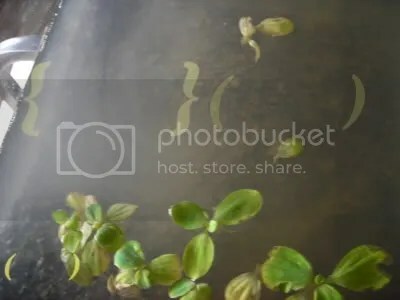 Curly braces: silt still swirling around in the water. Elliptical braces: you can almost see the substrate. Speaks for itself, dear noob. After washing the fancy Flouralite & running the filter for 24hrs. 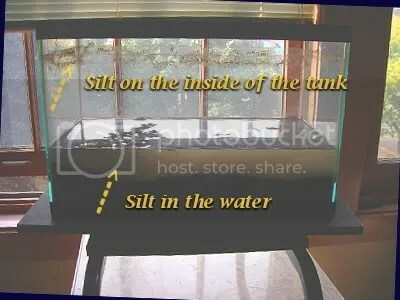 has to come through a window, two panes of glass and the water.